Later topic: Polishing ink plate? Where to attach Redington-style counter? I have a C&P 10x15 new style that has a Redington-style counter (with a counting lever on the right side) currently sitting up on the fountain with a string tied around the name plate. Is there a proper place to attach it to get it to count only on impressions and not count when the press is running with the throw-off lever engaged? It looks like the attached counter, but a left-hand model. I’d think the counter would be mounted on the roller arm. That’s the only place I’ve ever seen them installed on a New Series Chandler and Price. I’m not sure I know which arm Eric is referring to… maybe the throw off connection? The Redington counter on my C&P 10x15 attaches as shown in the images here. (The press is in the process of restoration, but the counter works just fine.) 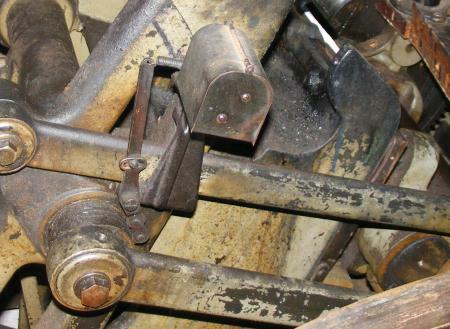 As you can see, it is attached via a bracket to the Roller Arm. This bracket also mounts a lever. 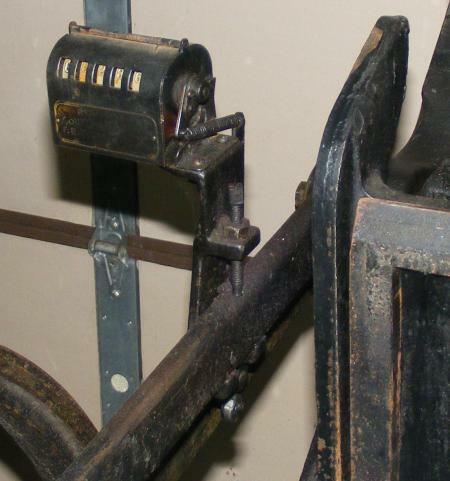 The top of this lever pulls a spring, which in turn pulls the short lever on the counter itself. 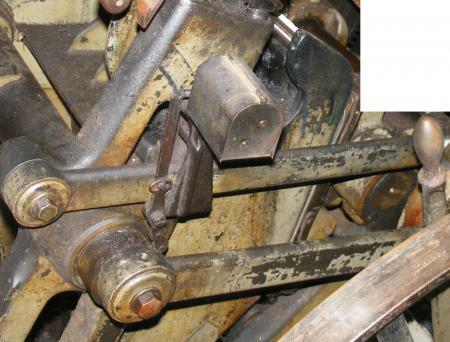 The bottom of this lever has small rollers which either strike or do not strike the eccentric for the throw-off. If the throw-off is in printing position (eccentric, and the whole bed assembly, forward) then the eccentric strikes the lever and counting occurs. If the throw-off is in non-printing position (eccentric, and the whole bed assembly, back a bit) then the eccentric JUST misses the lever and counting does not occur. This style of mounting is shown at least as early as the 1906 ATF American Line Type [specimen] Book, and at least as late as the 1953 Western Newspaper Union catalog No. 53. 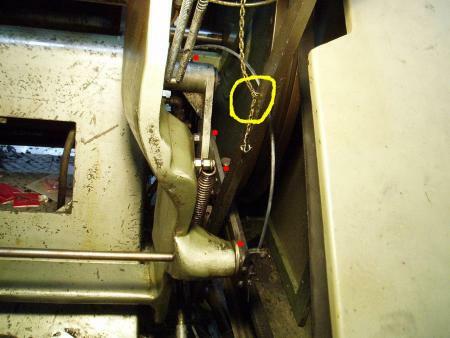 WNU indicates that the Model D style Redington counters for platen presses were furnished with the bracket. 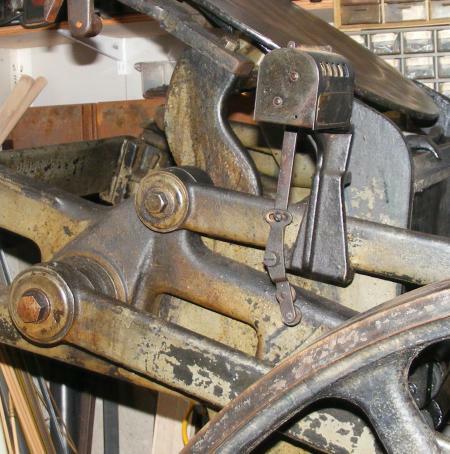 This style of counter has its short lever on the right side of the counter, and the whole unit with bracket mounts on the left side of the press (which is where the roller arm is). 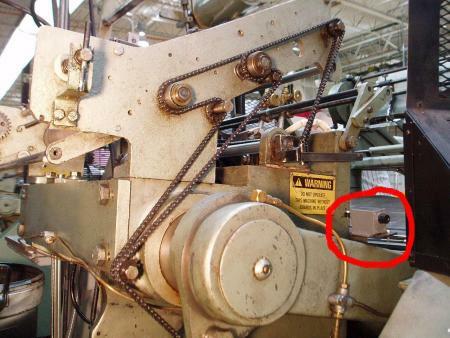 The WNU catalog also shows an “A” style Redington counter intended for cylinder presses. It too has its short arm on the right side of the counter. None would appear to be the “left handed” version you have. If you do not get it in the right spot you will smash the arm and rollers. Can you post a photo of your press & counter. Looking to see arms near the fly wheel. All you may need is,like ericm photo, is to drill a hole and use a light chain . Or, if it’s like David’s setup you may just have to get it the right position. —ericm, is that a kluge ehd 3-draw foil? nice an’ clean!